Today we are interviewing T.A. Foster, author of the romantic thriller "The Magnolia Affair." 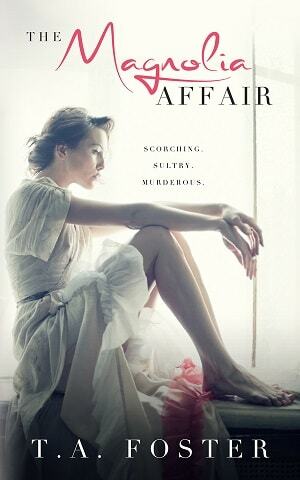 "The Magnolia Affair" is about a woman who finds herself caught up in a world she knows nothing about. Her naiveté becomes dangerous. As her story unfolds she ultimately has choices and that's what the book is about. What choices would you make? Who do you think would most appreciate “The Magnolia Affair”? I think fans of "Gone Girl" and "Scandal" would like it. It's sort of a blend of those types of genres. I've had a few readers tell me they caught glimpses of "House of Cards," but I've never seen that show. What inspired you to write about a woman whose life turns upside down when she has an affair with a senator? I read a news story last summer about a man who was found dead and later it was revealed his wife was having an affair with a very powerful man. The circumstances were completely different, but it started the wheels turning for me, and I started crafting the novel. Tell us a bit about the protagonist, Audrey Kingston. Audrey is like a lot of women. She has a life she always thought she wanted, but she catches glimpses of another path and it's enough to make her doubt herself. She's certainly a flawed character, but not a bad or evil one. She's human. Is Audrey aware of the potential consequences of her affair during its early stages or is she completely oblivious? She hasn't thought that far ahead when the affair begins. It's rather impulsive for her. The author I always come back to when I'm writing is Hemingway. Cut, cut, cut…I'm working on trying to shorten my descriptions and use just the right word every time. He was a master at that! My ultimate goal is that readers feel something. If you read a book and it gives you nothing back then what was the point? I have occasionally written things I hated, then deleted, then rewrote the same thing again. When I get stuck in that kind of rut I try to go for a walk or sneak in a workout. It usually helps. I'm working on a paranormal project right now with details coming out in the next couple of weeks. I am having an affair. I know what you’re thinking. There has to be a reason. There needs to be a reason. Something acceptable like after five years of marriage I had spent too many nights alone with a glass of wine. Or when my workaholic husband was home, we slept back to back, as if he had forgotten how to touch me. You’d want me to tell you that the only thing we exchanged was conversations about the weather and updates on what needed to be added to the grocery list. It would probably calm the judgment bubbling to the surface if I described how we ate dinner in front of the television, commenting occasionally on a drastic cliffhanger to be continued next week. You’d give me a look of pity if I told you he stopped noticing when I got my hair cut, or if I walked into the room in a new dress. The story would start to come together in your mind if I painted a picture of how we went to bed at separate times out of habit, forgetting that we once scheduled everything around the other. You could see it happening. You would almost feel it slipping away like water through your fingertips. It might create doubt about your own marriage, even though you’d shake your head, knowing that couldn’t happen to you. Little pieces of your own truth filtering in between the images you have of us. But, I have a confession. Something you won’t want to hear. Words that will haunt you more than the excuses. None of it is true. My husband didn’t do those things. There isn’t a single thing that led me to another man. I am having an affair for the worst possible reason. Because I can.